I had to provide explanations of the films for nearly every audience. Most of the films were made crudely and carelessly, and an average viewer seeing them for the first time cannot understand them completely. Solving the riddles with the glosses made the film understandable even to the nearly illiterate. Comrade Lenin attached great significance to the use of film in the work of the agitational trains and steamers. And so on January 6, 1920, I leave with Comrade Kalinin for the southeast front. I take films with me. Including THE ANNIVERSARY OF THE REVOLUTION (1918) [Vertov’s first film]. We study the new viewer. 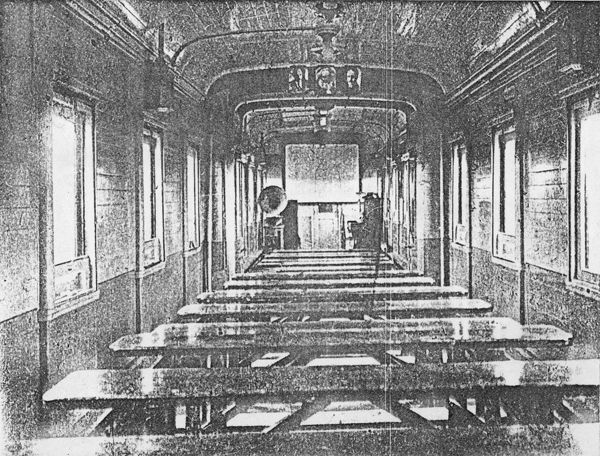 We screen that film at all the train stops and carry it to urban movie theatres. At the same time, we shoot. 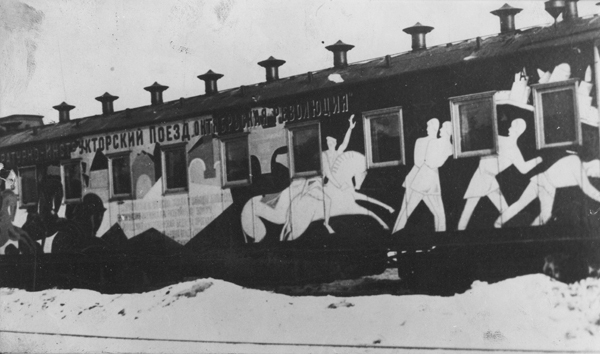 As he suggests, Vertov’s work on agit-trains extended to the creation of 43 issues of the Kinondelja (Kino-Week) series of newsreels. 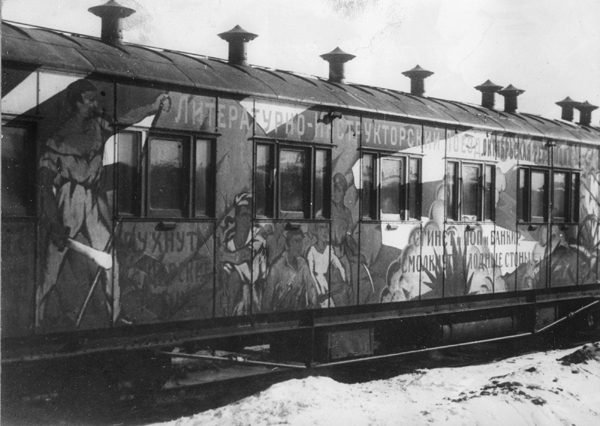 By spring 1922, Vertov began devoting his efforts more centrally to his noted Kinopravda newsreel series, but the years of itinerant exhibition experience left him a major proponent of Soviet mobile cinema as propaganda exhibition diversified to include mobile film trucks, and temporary collapsible outdoor venues which held greater flexibility than those on rails. 1. Peter Kenez, The Birth of the Propaganda State: Soviet Methods of Mass Mobilization, 1917–1929 (Cambridge: Cambridge University Press, 1985), 59. 2. Exhaustive statistics can be found in Lidija Vladimirovna Maksakova’s Agitpoezd 'Oktjabr’skajaRevoljucija‘ 1919–1920 (Moskva: Akad.nauk. 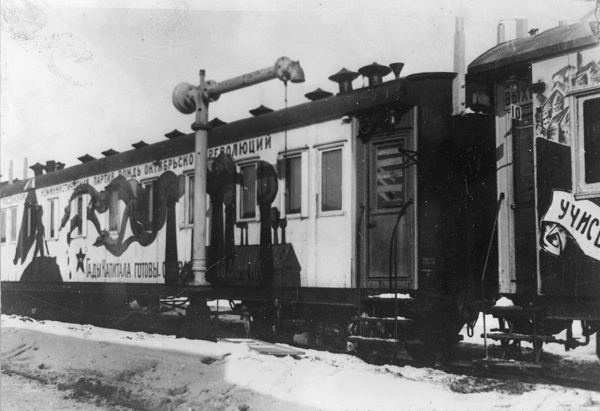 SSSR, 1956) – an indispensible study that provides vast numeric documentation regarding agit-train and agit-steamboat journeys. 3. Although rumors of mobile film processing labs persist, no evidence of this has been uncovered to date. 4. For colorful images of the trains, see: V.P. Tolstoj (ed. ), Agitmassovoe Iskusstvo Sovetskoj Rossii: Materialy i dokumenty. Agitpoezda i agitparochody. Peredvižnoj teatr. Političeskij plakat. 1918–1932, 2 vols. (Moskva: Iskusstvo, 2002). David King’s Red Star over Russia: A Visual History of the Soviet Union from the Revolution to the Death of Stalin (New York: Abrams, 2009), provides many details connected to train decoration and cites Vjačeslav Polonskij’s tome Russkij revoljucionnyj plakat (The Russian Revolutionary Poster) from 1925, which argues that the language and style used on agit-trains was very similar to the Russian Petruška theatre. 6. See the related document “Confirmation no. 11001,” in Thomas Tode and Barbara Wurm (eds. 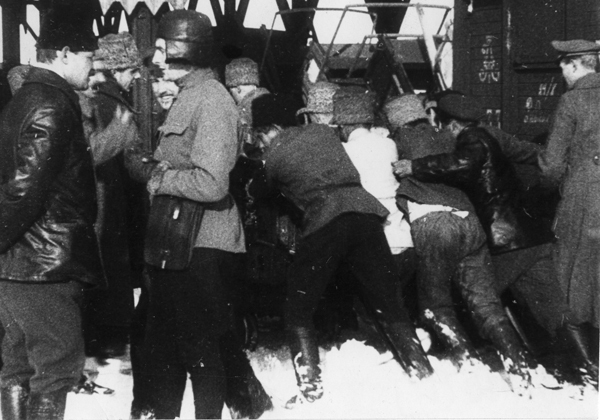 ), Dziga Vertov: The Vertov Collection at the Austrian Film Museum (Vienna: Synema, 2006), 218. A selection of documents has been published there, while the whole collection is searchable online on the Austrian Film Museum’s website. 7. John MacKay, Dziga Vertov: Life and Work (forthcoming). MacKay quotes RGALI f. 2091, op. 2, d. 386, 1. 19ob (from report to Grigorij Lemberg). 8. Dziga Vertov, “O moej ljubvi k živomu čeloveku (About Love for the Living Person),” 1958, cited in Annette Michelson (ed. ), Kino-Eye. The Writings of Dziga Vertov (Berkeley: University of California Press, 1984), 151. Adelheid Heftberger is an archivist and researcher at the Austrian Film Museum in Vienna since 2007. She holds M.A. degrees in Slavic studies and comparative literature from the University of Innsbruck in Austria. Among other responsbilities she serves as curator of the Film Museum's Dziga Vertov Collection. She is currently writing her Ph.D. thesis on data mining and the visualization of filmic structures in the films of Dziga Vertov.